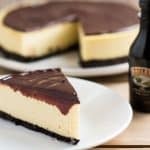 This is a silky smooth cheesecake with the flavor of sweet Irish cream and a rich chocolate Oreo crust. Place Oreos in a food processor and run until cookies break into fine crumbs. Transfer cookie crumbs to a mixing bowl and add melted butter. Stir to combine. Pour crumb mixture into 7″x 3″ push pan or springform pan. Using a glass (or fingertips), press down crumbs smoothing into an even layer. Then place pan in freezer while preparing batter. Add sugar and cornstarch to large mixing bowl and whisk together. Then add cream cheese and blend until smooth. Mix in eggs one at a time until fully incorporated. Then add Bailey’s and vanilla and beat until just combined. Remove cheesecake crust from freezer and pour batter into pan. Cover pan with foil. Add 1 1/2 cups water and 3-inch trivet to Instant Pot. Place pan on top of 2-inch trivet and cook for 40 minutes at high pressure. Once cook time is complete, allow pressure to release naturally. Then carefully remove cheesecake from pot. Remove foil and allow cheesecake to cool for one hour or until room temperature. Once cool, carefully run a paring knife around the edge of the cheesecake to separate from pan. Refrigerate for at least 6 hours, preferably overnight. Carefully push cheesecake up from push pan by placing center of push pan on a can or glass and pushing edges down. If using springform pan, gently remove outer edge of pan. Note: Prepare the ganache once the cheesecake has cooled and is ready to serve. Mix 1 tsp instant coffee with 1/2 tsp hot water and mix until smooth. Set aside. Add chocolate chips to small bowl. Add heavy cream to the Instant Pot and heat on low sauté until it starts to simmer, then immediately remove from heat. Combine chocolate chips, coffee mixture and heated cream and whisk until smooth. Cool to room temp, then pour desired amount on top of ready to serve cheesecake. Then place in fridge to harden slightly or serve immediately. If you're a fan of Bailey's and coffee, you might like adding instant coffee to the Oreo mixture. We loved it, so we just listed it as optional. To prevent holes/bubbles on the top of the cheesecake, lightly tap pan against counter after pouring batter in. This will bring some of the air bubbles to the surface. Then, use a toothpick to burst any bubbles you see.